Victory Garden Café comes pretty close to a little piece of Greece in Astoria. Located at 21-69 Steinway Street, Victory Garden Café was initially established as a sweet shop in 1968 by the Sakalis family, serving Greek pastries and delicacies to those who were in search of a slice of home, or to those who were open to expanding their palates. Years later, Victory expanded into a restaurant, complete with a back garden open to hosting private events such as birthdays, wedding showers, and even wedding receptions. At Victory Garden Café, patrons can opt for …/ Greek-style turkey, accompanied by Thanksgiving classics such as stuffing and fresh Greek salad. Additional a la carte menu items include sirloin steak, calamari, and sweet potato, among other options. The Victory Garden Cafe is a place you can truly get lost in. Among the running stream, the green plant life, the cushiony seating and European styled outdoor chairs and tables, it is hard not to be whisked into what it may feel like (if only there was a great sparkling sea just down the road). But that’s OK, because the food is definitely on the way. The best part of Victory Garden Cafe however is their events. From word of mouth, it is a perfect place to go for anything from a Bridal Party, to a sweet 16 to wedding celebrations. They cater for anyone, and the service is always on point. So if you’re feeling a little Mediterranean, and want to bask in inspiring atmosphere, visit the Victory Garden Cafe. Located just off the subway in Astoria, Queens, this Greek gem offers fine pastries, food and a private garden for celebration. With twinkling lights, classic marble and stonework and tasteful decor, you’ll feel you’ve been transported to a fairy grotto on a Greek island as the water in the rock foundation trickles behind you,” venue representatives said. This cool and quiet garden venue happens to be attached to a well-loved cafe and sweet shop. The Victory Garden Cafe is certainly a little taste of Greece, especially with available classic Greek desserts such as kataifi and ravani. Take a trip to the back of the restaurant and you'll be greeted by a Euro-Mediterranean-styled patio with hanging vines and small fountain. The brunch menu consists of large portion plates, such as Tsoureki French toast, thick bacon slices and, my husband insists, a very decent bloody mary. There's enough space in the front for strollers and high chairs. Come early to secure a table in the garden. 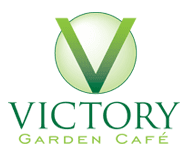 Enjoy a memorable and hassle-free dinner at Victory Garden Cafe. Greek Stuffed Turkey and other Greek Specialties. Our Glass-Enclosed Heated Garden provides the perfect atmosphere for a family or any gathering!Pick up some of our delicious Greek desserts, available in decorated variety platters. In business since 1968, this family-owned bakery has been satisfying the sweet tooth of local residents with a dazzling variety of American style cakes and cookies as well as Greek pastries such as Baklava, Galaktoboureko, Karidopita (walnut cake), Amigdalou (almond vanilla cake) and Sokolatina, which is one of the best chocolate cream cakes you'll ever eat.Astoria has quite a few outdoor dining patios and gardens; more than you will find in most of the other boroughs. But the backyard at Victory Cafe has to be one of the most spell-binding al fresco dining spots of them all. Stone walls enclosed an oasis that is filled with a flowing water fountain, sculptures, small trees, and shrubs. Colorful flowers and candles decorate the tables. Long, green vines hang from the back wall, next to soft, plush couches and overstuffed chairs. Quality: Excellent. Appeal: Excellent. Service: Excellent. Came to Victory Garden Cafe for a business meeting and must say it was a great experience. The service was welcoming and the food and desserts were amazing. My co-workers and I tried the crispy calamari, the Euro panini & Chicken Balsamico. For dessert we had the Strawberry cheesecake & Tiramisu. I will be visiting again soon. After my visit at Victory Garden Cafe I must say that I felt like I traveled back to Greece. The modern indoor & outdoor space is incredible. I went with a few friends that came from Greece for dinner and they were amazed at the quality of the food. We ordered the Seafood Combination, "Victory's Meat Platter and the Ikoumeniki Salad which came with Halloumi Cheese (a type of cheese popular in Cyprus). Everything was cooked to perfection. For dessert we had the Galaktobouriko, Greek Style Apple Pie & Baklava. Everything was incredibly fresh. Will be back soon. I visited Victory Garden Cafe yesterday and i was amazed with the quality of the food, service, sweets and drinks. My friends and I had a number of appetizers including the Tirokeftedes (Mediteranian cheese balls) Calamari and the Seafood Combination. The selection offered was outstanding as well as the quality of the food. I would definitely recommend this place! Its classy environment, european outdoor seating and outstanding food makes Victory Garden Cafe a instant favorite. Just stopped by Victory Garden Cafe, next to Victory Sweet Shop, amazing food, incredible atmosphere, European style indoor and outdoor seating. This is the place to go. Also, all the Greek Food, the Greek sweets, are awesome. One of us is Greek,and bakes every type of Greek sweet imaginable, so you can believe me when I say that Victory is the best.We've been customers for 18 years.The amigdalota(almond macaroons) are moist and,full of almond paste.Every Greek bakery that I've been to in Astoria or Manhattan bakes these cookies with so much sugar,it overpowers the almond taste.The pastries at Victory are delicious and aren't swimming in syrup, like those of other bakeries.Try the galatoboureko(custard squares) kataifi,(nutty pastries wrapped in shredded filo dough,or the ekmek kataifi(the nut rolls with a custard topping).Victory also sells a variety of butter cookies ,and the traditional Greek New Year's sweet bread, and Easter braided bread . There are a few tables if you care to eat your sweets right away. Anything you try is sure to please,and service is excellent and staff , personable.The added bonus is that prices are low, too! I came here for brunch on Sunday. It was delicious and very reasonable. Their pastries are tasty as well. The outdoor garden is beautiful and I'm looking forward to enjoying it when the weather warms up. Victory Sweet Shop is a Hidden little gem in on Steinway Street. I used to go there all the time for cheese pies when it was just a bakery, when they expanded to a full restaurant and bar I was so impressed with the job they did. The decor, the food the customer service, every thing about this place Wowed me. My favorite part is the backyard Garden. They did a wonderful job and creating an ambience where you forget your in Queens and think your on a tropical Greek Island. It's beautiful at night with the lights. I highly recommend for food and ambience. Oh my goodness was everything delicious! Our souvlakia were melt in your mouth scrumptious... and the desserts we brought home for my mom, she is envious of 😉 Enough said.. Wish I just lived CLOSER! Recently my girlfriend and I went to the Victory Sweet shop in Astoria and it was phenomenal. The inside is very nice but the outside is what really sold me on the spot. Elegant lighting and the waterfalls sounds are relaxing. The server was attentive and informative, suggesting the cocktail 'Victory Love Potion' which was tasty and surprisingly strong for what looks like 'fruity drink', and to munch we had the kria pikilla, which we enjoyed as well. Amazing place. Awesome food. Great ambiance, family friendly. You don't have to wait for a table. You are greeted with a smile. The service us unbelievable, the waitress/waiter are very attentive. As soon as you walk in it reminds you off walking into a cafe on the beach. This place makes you feel like you're on a Greek island. . We had the octopus, sea food salad and a couple glasses of their signature wine drinks (love potion) - the food was amazing and at a good price.. Can't wait for spring/summer so we can sit outside in the garden... We'll be back very soon. This is my third time at Victory Garden Cafe. They are still pretty new, I think they opened last summer. I've been twice for coffee and dessert. This time we went for brunch. I had a Mediterranean omelet and my bf had the French Toast. Food was really fresh and reasonably priced. We went around noon and were able to get a table no problem. It's nice not to deal with the brunch crowds and long waits. They have a counter full of fresh pastries, a great way to finish your meal. We shared a baklava. See pic posted 🙂 They have a pretty outdoor garden area, can't wait to try it when it gets warmer!! Always a pleasure, my favorite bakery! Everything is always fresh! They are very accommodating and pleasant! I look forward to joining them for brunch very soon! The Gray's Anatomy textbook describes Amygdala as almond shaped groups of nuclei located deep within the brain, shown by research to perform a primary role in the processing and memory of emotional reactions...and appear to play a role in binge drinking. Amygdalota are Greek almond cookies that can similarly stimulate either pleasant emotions (from consumption) or negative emotions (from fear of scarcity or sadness from deprivation) - and play a role in binge eating as a result of addictive indulgence and withdrawal. So, I wasn't born in Greece and have no childhood memories of visitors showing up at my house with a ribbon-tied box from a Greek bakery containing these simple, wholesome, and rewarding cookies. Light, perfect with coffee (or in my case: as breakfast! ), or as a snack, these cookies outshine Amaretti, Pignoli, Macaroons, and any other category of cookies in the extended family. Crisp on the outside and soft and chewy on the inside, topped with sliced almonds, and infusing the air with a whiff of almond scent, Amygdalota are positively intoxicating - and would be the ode of many a poet. Particularly if they were from Victory Sweet Shop that makes the best version I've tried in the city, with the freshness preserved as they do in Greece - by wrapping them in plastic. I've shared them with coworkers, who've raved about their lightness, having anticipated a heavier, traditional cookie instead. Victory Sweet Shop may be the premier exponent of this cookie in the city, but they are not limited to one trick. Their Melomakarona (or Finikia) are also the best in the city, besting my prior favorite version at Artopolis bakery. These shortbread cookies have been soaked in syrup until they are almost like the Indian Besan Laddoo in texture, but Victory's version helped me understand that the texture is intended to hold its form right until the moment you bite into it, at which moment it crumbles into sandy pieces until it dissolves in the mouth and becomes one with the soul! Even people who aren't fans of honey syrup sweets (like my Mom) fall in love with Victory's Melomakarona (hints of cinnamon, clove, orange juice)! That is not a word I use with Greek bakeries, for it is extremely difficult to maintain the necessary turnover to keep a fresh product on display. At Victory, the phone is ringing non-stop to place an order, and whatever remains is likely to be scooped up by the foot traffic. So, obviously, not everything will be as fresh as one could wish for, but a tell-tale visual sign is whether the tray is almost full. You can almost be guaranteed of freshness, unlike the same visual stimuli at other bakeries. I've had excellent Baklava, Saragli, Galaktoboureko, Kataifi here, as have I had wonderful Karidopita (walnut cake), Shamali and Ravani. In fact, I've learnt to tell the difference between the latter two - thanks to the exceptionally superior and light versions at Victory Sweet Shop. So, yes: I've been cheating on you, macarons..... I blame the Amygdal(ot)a for overpowering my senses, and emotions. teleported to a Greek island! Just look at the photos on this page and you'll see. I came here during the day so I can imagine how romantic it feels during the evening. The decor simply stunning. The only negative is that it's a small place so if get's busy you might have to wait awhile be able to sit outside although I don't know how they'll manage in the winter since there are many tables indoors but anyhoos! The frappe here rocks! I had a cheese pie which is not the phyllo type which I like since I like a pie to have a hard crust. They serve it with a small veggie salad. My friend ordered the chocolate platter and OMG he couldn't believe how good it was. He also ordered nescafe and they brought him two cookies complimentary! Lastly the service was very good. Everyone was smiling and went out of their way to make us feel comfortable. I see myself coming back here again. Perhaps people are sick of cafe's but I happen to enjoy them. Victory sweet shop on Steinway off of Ditmars has opened a charming cafe with a lovely garden in the back. It is not on the street and is rather quiet - no blasting music. We had a frappe float and an Fredocino (Iced Cappucino) and they were both excellent. They serve all coffee drinks with Biscotti and the prices were lower than the places on 30th Avenue. It was a lovely relaxing experience! Best food ever,great owner great service,great atmosphere. I visited Victory Last night. well become my fave dine out in Astoria! Cheers! The best cafe in astoria luv you guys!!! A nice cozy place to go have a coffee late night or just be with friends in a family atmosphere. A great place to go. I almost don't want to review this place because I don't want people to catch on to this place. It is truly Greek in a neighborhood that is slowly but surely being taken over by hipsters. This long time family owned restaurant is my hideaway with its backyard patio, water fountains and fresh food. The watermelon and cheese salad is the best sweet and salty combo. The chicken eggplant sandwich is to die for. The seafood is all fresh and perfectly grilled. I can't go on enough about how much I love this place. If I ever had an event it would be thrown here without a doubt. My wife and I hosted our Brunch Baby Shower here on January 28th and everything was AMAZING. We originally found this place while looking for spaces to host the baby shower and their outdoor-indoor garden space immediately caught our eye. I reached out to their event planner Anna and I have to say that from day one she was very attentive and professional. She responded to email inquiries promptly and was very accommodating when it came to our face to face visits (we would normally meet after 7 o'clock). We met in person a few times to coordinate all the details for the event; one thing we loved was that catering is included in all the packages. That took a huge weight off our shoulders. Their brunch menu had many different options to choose from and the cake, cupcakes and cake pops were absolutely delicious. The day of the event Anna and her team were there the whole time making sure that everything was just perfect. The venue's staff are A+, I mean they wouldn't even wait for a drink pitcher to be near empty before they would be on top of it and bringing out a new one. Overall we are super happy with our experience. I can not recommend Anna enough. She met with me many times; responded to multiple emails within minutes, and made sure the day was better than I could have even imagined. I had 5 crates of decorations and lots of instructions (yup - I was that bride) and she turned my vision into a reality that took my guests' breath away. . She even created a video for us of the day; which was wonderful since we didn't have a videographer. This is the place to have your wedding - especially a morning wedding / brunch like we had.